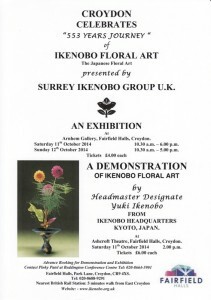 Surrey Ikenobo Ikebana is holding another of is fantastic events. Entitled “Croydon celebrates 553 years’ Journey of Ikenobo Floral Art…”, Hansa Patel and her members’ event will be special. To be held at The Fairfield Halls, Croydon, there will be a exhibition of members and guests Ikebana arrangements and a demonstration of Ikenobo Ikebana by the Headmaster Designate, Yuki Ikenobo.